In this lesson, Mike Pope teaches simple chord voicings that can be moved up and down the guitar neck to bring variety to the common chords he plays. * Michael believes power chords are underused in worship music and should be used more often. * A power chord is just the lower 3 notes of a bar chord. * They sound like punk rock, and have a low sound, a more focused sound. * They sound more aggressive and work for a rock and roll sound. * Playing the 3rd of the chord an octave up. * These are similar to a power chord but a little more open. * you can also take your your 2nd finger and move it down a half step to make your major chords. You can also take that same voicing (root, 5th and major 3rd an octave up), but use your index finger, ring finger and pinkie to move it over a string set. 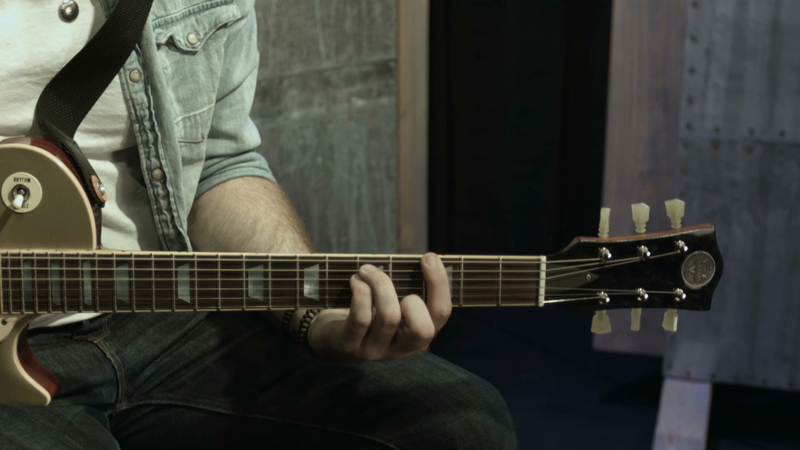 These chords are great for rhythm playing, especially if you’re the only guitarist playing. You can also add a drone note. For example, the G note can actually drone over all the chord changes. By adding a drone note you make the chords sound even bigger. To take it one step further, you can eliminate the root note, and play the 5th and the major 3rd and octave up, while still droning those extra notes. this is a really popular voicing. The sounds are focused but have a really nice way of ringing out. This is a great way to start out. From here you can start adding notes. These voicings are what Bethel music used for Deep Cries Out. * You can add your pinkie to do a G-Sus chord, which works over the 4, and sometimes over the 6.